Almost every prospective buyer of an off the plan apartment or townhouse wants to be reassured that they’re making a smart decision. Buyers especially want to know if the property will increase in value over time, but resale value is a topic many developers shy away from or simply don’t consider when they plan and create projects. It’s easy to see why resale value is critical. No-one wants to make a mediocre real estate decision. From where I stand, resale value is a hot-button topic with purchasers and it’s only going to grow in importance. Certainly, talking with would-be buyers about the outlook for prices growth and the reasons why a particular property is likely to experience capital growth can be a high-value conversation. If you get that conversation right, you get the sale. But if the buyer thinks there is not enough of a point of difference or there are sub-par interior finishes compared to other projects, they’ll pull back and look elsewhere. Developers must remember that the buyers have more resources than ever before about buying off the plan. When was the last time you googled, ‘buying off the plan’?There’s an absolute mine of information out there. A lot of it concerns what makes a good off the plan development and the go-to qualities and finishes to search for. Builders and developers who choose not to pay attention to the fact that the typical off the plan buyer is now very value-focused and better educated than they once were, do so at their peril. In today’s market, resale value is a vital consideration that can and will add value to your brand. When I meet with my developer clients, I always maintain that it pays long-term dividends to conceive, develop and construct high-quality products. Design innovation, fewer but higher quality non-fashionable finishes, the liveability of the spaces – these are the things that matter to the buyers. You’ve got to spend the money on the right things and allocate extra spending to where it counts. Most importantly you have to constantly consider: how will your project fair over time?A developer reaps the benefit of long term resale values in many subtle ways. Think about it. The project investors that have retained properties within a development all enjoy a secondary long-term benefit. The existing occupants (both owners and tenants) will spruik the merit of buying from you and single-out your developer brand in all sorts of positive ways. Remember, too, that any resale marketing program for one of your earlier-developed properties will put a fresh spotlight on your development brand again. It is free publicity for your next project. If you develop a product that goes on to generate solid capital appreciation and which scores ticks of approval from investor owners, owner-occupiers and tenants, you’ll achieve brand development via social media, design websites and word of mouth. That can mean less expenditure on sales and marketing when you launch your next development campaign. Buyers can drive by your finished product and simply like what they see. The effect of seeing one of your finished developments is often just as impressive to a new buyer as seeing an expensive display suite, sometimes more so. 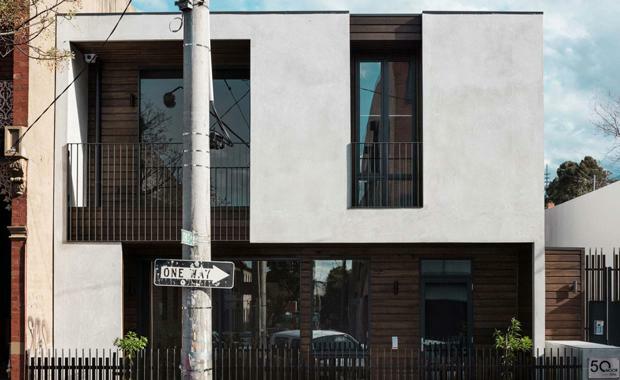 50 Moor Street, Fitzroy[/caption]One of my developer clients, Milieu, is at the top tier of delivering high-quality projects that have ongoing appeal. This was highlighted by the resale of 4/50 Moor Street, Fitzroy, in February 2016. This project of high-end town residences was completed 18 months ago. Back then, Residence 4 sold for $765,000 or $10,928 per square metre. At the time, this result was considered to be above market for a 70sqm townhouse. I auctioned this property in February for the current owner, who purchased it off the plan. After a heated auction the property sold for $900,000 which equates to approximately $12,850psm. Why did this town residence fare so well in the secondary market?There is no doubt the property’s location, midway between Brunswick Street and the Carlton Gardens but in a relatively quiet residential street, was a magnet for buyers. But so was the design quality. The Moor Street project is the work of award-winning Neil Architecture and Milieu Property. Residence 4 is set to the rear of the development of five and offers two bedrooms with a high-ceilinged living and dining room flowing to screened balcony with a leafy outlook. There is a custom kitchen with Miele appliances and marble benchtops, plus a stylish bathroom, separate WC and concealed laundry. All in all, this ultra-smart property appeals to a key and cashed-up demographic in inner-Melbourne. Added to this, the February auction and resale process has generated immediate benefits for Milieu. For example, the above-average resale price we achieved for Moor Street will work to convince losing bidders to transition to other off the plan offerings by Milieu such as its Hertford Street project. Other owners within the Moor Street project will likely recommend that friends consider Milieu offerings. Word of mouth publicity is very hard to beat. Already there has been a notable spike in enquiries generated for yet another project in Fitzroy North that’s at a similar price point. We’ve as well had queries from landlords using Nelson Alexander’s property management services – they’re all enquiring about what else Milieu has available. If you’re a developer, never lose sight of the fact that quality pays. Roland Paterson is a partner and sales manager at Nelson Alexander. Nelson Alexander delivers real estate services to homes across the north of Melbourne from 15 office locations.